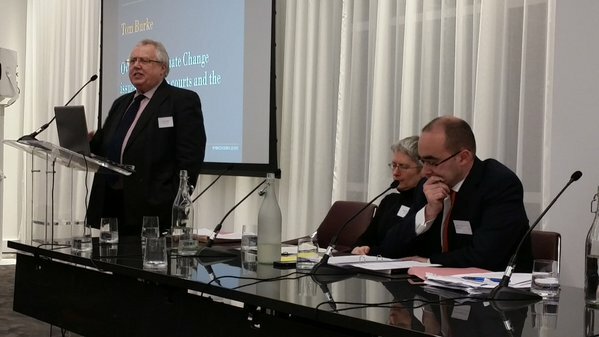 Remarks by Mr Tom Burke CBE at the ‘Climate Change And The Courts’ Seminar, 70 Kingsway, London on December 1st 2015. I want to thank Ukela for inviting me to talk to you today though I must admit I accepted the invitation with some trepidation. As a non-lawyer amid such learned and distinguished company I was not at all sure that I would have anything relevant to say. I do know quite a lot about climate change policy and politics – they are not the same – and I know Richard Macrory very well – having made the mistake of hiring him to become Friends Of The Earth’s in-house lawyer some forty years ago this year. That was a mistake for which I have paid ever since as he has roped me ever more deeply into the legal world. My main reason for accepting was the critical importance of getting it right on climate change. If we fail, I fear that the rule of law itself will be in question. I was asked to give you an overview in where the law and the courts fit into humanity’s efforts to keep the climate safe. In forty five years as an environmentalist my principal purpose, in many ways, has been to extend the rule of law over the then environmentally untamed wilderness of the economy. Essentially the UNFCCC is the global peak of the still immature effort to extend the rule of law over the way in which human beings manage the planet. This is an effort which I read recently has generated some 840 items of climate law of one kind or another. President Obama speaking in Paris yesterday talked of climate change shaping the contours of this century like no other issue. He was right. There are four more reasons why this is different from most other issues that law is asked to address. First, it impacts literally every single person on the planet. The success or failure of climate policy will determine the security and prosperity of everyone on the planet. Second, the changes we have already made are, effectively, irreversible and therefore bind future generations in a way not possible by other human actions. For the irreversible changes to which we are already committed to remain manageable then our policy must succeed within a specific, and rather short, time. Finally, this issue suffers from what the Governor of the Bank of England called the tragedy of the horizon. As he explained, the difficulty with climate change is that by the time the need to act is apparent it will be too late to do so. I cannot think of another instance where we have tried to develop law prior to experience of its absence. The role the law and the courts will play in meeting the challenge of climate change will be shaped in part by the policies governments translate into law and in part by the available evidence to determine issues that come before the courts. Evidence to be decisive must, at least to my layman’s eye, pass one of two tests. It must convince beyond reasonable doubt or it must convince on the balance of probabilities. This raises a central question. What do we know about the climate and the impacts on human beings of a changing climate? What weight can we reasonably attach to that knowledge? This is a much contested issue which it may be worth examining in a little detail. We know with certainty the concentrations of the various greenhouse gases in the atmosphere and we know that they are increasing and we know that they will alter the temperature of the planet. We know with somewhat less precision the sources of those emissions. We know with some confidence, but not with certainty, the probability of the temperature that will arise from those concentrations. We have good descriptions of the impacts of different temperatures on large geophysical systems such as glaciers or the ocean’s temperature and can model their future behaviour with some, but still developing, confidence. We have some confidence at planetary scale, based on modelling, of how temperature rises will affect the probability of extreme weather events but we are some way from being able to model such events at high resolution. We do know, however, with high confidence that climate change is structurally altering the baseline on which current prudential assessments of such risks are made. We do not yet have complete and reliable descriptions of the cumulative impact of these changes on biological systems, including the agriculture, forestry and fisheries which are central to human welfare. This makes arriving at some estimate of the damage to these systems caused by climate change speculative at best. Current attempts by economists to do so do not command confidence, even within the profession. All of these changes will impact cumulatively, both directly and indirectly, on the welfare of human beings in ways that will vary greatly depending on geography, capability of governance, level of affluence and many other factors. 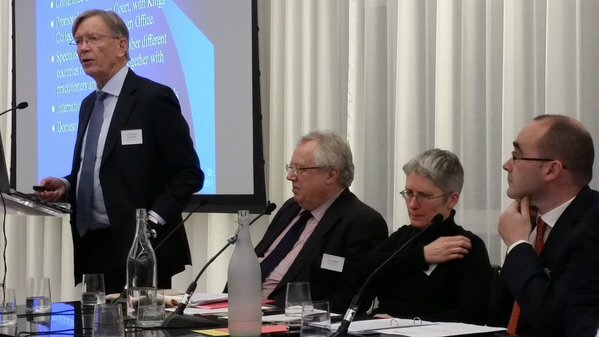 The law and the courts face being asked to help meet the challenge of climate change in the face of deep structural uncertainties in the knowledge base from which to derive evidence. Some of these uncertainties will diminish over time but most will remain into the foreseeable future. The good news is that not all of these challenges will be in front of the courts tomorrow so there is time to think them. The less good news is that in order to develop effective policies governments need advice right now about what kind of laws to enact. There are two critical avenues to be explored. The first is to develop legal instruments that will prevent greenhouse gases from accumulating in the atmosphere and so changing the climate. The second is to develop legal instruments to allocate responsibility for the damage caused by carbon pollution and to provide some means of redress against those responsible for those whose interests are harmed. There is no great problem in principle in designing laws to prevent climate change. Carbon dioxide, as the US Supreme Court has opined, is dangerous to human health. Its release to the atmosphere could simply be prohibited in the same way as the emission of other dangerous pollutants is banned. The real problem is that the legal tools used to prevent dangerous climate change must do without simultaneously damaging the availability of the other necessities for prosperity and security. This raises the interesting, and as yet not much explored question, at least that I have seen, of the scope of the interface between the law and climate change. Is the challenge primarily to develop a new body of international and domestic law to manage responsibly for the shared asset of a stable climate? Or, is it primarily to review the existing body of established law to amend or extend it so that it is a better fit to the purpose of preventing dangerous climate change? If the latter, how wide should this review go. Clearly, it will need to cover environmental laws but as climate policy and energy policy are two sides of the same coin, will it also need to cover energy law? Given, on the one hand the scale of consequences from a changing climate, and on the other the deep uncertainties in the knowledge base, is there reason to review company law and other statutes governing the responsible management of risk? Of course, the answer is probably, both. But if so, what is the proper alignment between domestic and international law and how is that to be achieved? I have already rehearsed many of the difficulties in arriving at a satisfactory solution to the second challenge. That there is, and will be more, damage is clear. It is also clear that the burning of fossil fuels is primarily, but not exclusively, responsible for that damage. But how to establish a link between specific damage and a specific emission is not at all clear. Does that mean that we need to establish some way of allocating collective responsibility and delivering collective redress? And how is responsibility between countries to be assessed and allocated and in which courts? Some countries face an existential threat from climate change, what would constitute redress for that damage? I hope I have done enough to raise sufficient questions to reassure you that there will be no shortage of work for lawyers or the courts as we tackle climate change. But I am very glad that, as a non lawyer, it will fall to you and not me to provide the answers.